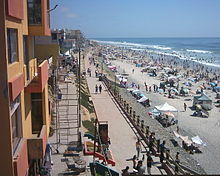 Playas de Tijuana (Spanish for "beaches of Tijuana") is the westernmost borough of the municipality of Tijuana, Baja California. 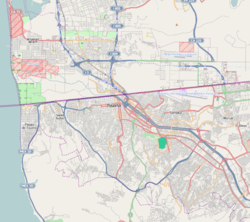 The borough of Playas de Tijuana is located in the city of Tijuana, bordered by the Pacific Ocean to the west, the United States ( California ) to the north, the municipality of Playas de Rosarito to the south and the boroughs Centro to the Northeast and San Antonio de los Buenos to the East. The US Mexico border wall is also here and to the north of the wall is Border State Field Park. Its administration or government relies on a Municipal Delegate, or Delegado Municipal (in Spanish), who is appointed by the Municipal President of Tijuana. This is where the beaches of Tijuana are located (hence the name) and it is also one of the two exits to the south towards Rosarito and Ensenada. The Paseo Ensenada is a popular place for meeting and passing free time, and where major commercial centres and businesses are located. Plaza Coronado, which is located at the beginning of Paseo Ensenada, is the major entertainment centre, where mainly young people gather every day to spend free time. Water sports such as surfing, bodyboarding, and kayaking are available when ocean water quality is good—the water quality can be very bad soon after it rains. The Monumental bullring is located here as well as the Tijuana-campus of the Universidad Iberoamericana. Playas de Tijuana has its own Arts & Culture House, which has many local and artistic endeavors, such as a ballet school, a drawing school, painting school, dancing school, and many others. The Arts & Culture House is located inside the complex where the local government building is, and also inside the complex there is another smaller bullfight ring, known as the Cortijo San José, which sometimes hosts rodeo shows. Along with the administration buildings, the House, and the Cortijo, there is a civic square where every September 15 is held the independence celebration. Playas de Tijuana is home to several NGO that are leaders in local issues like sustainable development, clean water quality in local beaches and public policy like open space and parkland protection and against a number of housing developments that prevent free access to local beaches and urban sprawl and violence. Federal Highway 1-D starts just south of this borough towards Rosarito and Ensenada. Oceano21 - A 9-story ocean front mid-rise. Playas has been recently experiencing mid/high-rise building growth despite opposition from environmental organizations and local laws. One project is the 17-story high Park Towers complex, with four towers projected. Many other low-rise buildings, ranging from 5+ story are found throughout Playas. However, the economic downturn beginning in 2008 has caused many half-finished projects to be abandoned. ^ Residence Inn by Marriott - Real del Mar. ^ (in Spanish) La Cúspide Residencial. Wikivoyage has a travel guide for Playas de Tijuana. 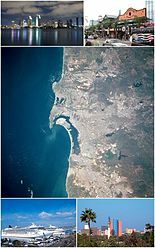 Wikimedia Commons has media related to Beaches of Tijuana, B.C.. This page was last edited on 16 March 2019, at 20:28 (UTC).